RBTH presents a selection of views from leading Russian media on international events, featuring reports on the removal of Palestinian Islamist movement Hamas from a list of terrorist organizations by an EU court, the continuing failure of diplomatic efforts to restart talks on Ukraine, and the United States’ decision to restore diplomatic relations with Cuba. 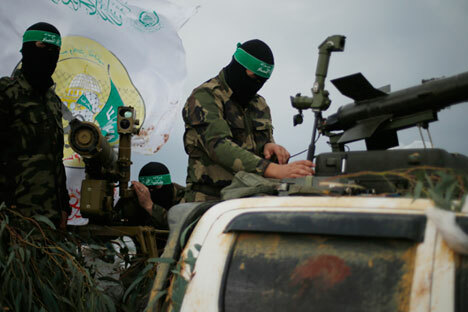 The business daily Vedomosti reports that a top European Union court has removed the Palestinian Islamist group Hamas from the list of terrorist organizations. The judges came to the conclusion that the court’s original decision to add Hamas to the list was based not on an analysis of the group’s actions, but on “factual imputations derived from the press and the internet.” The funding freezes on the group will remain in place for three months. However, Brussels may put Hamas back on the list if new legal justification is presented, Vedomosti writes. The Council of the European Union adopted a “general resolution” against terrorism in December 2001 and added Hamas to the terrorist organization list that same year. In 2010, the Qatari government submitted an appeal to the European court, representing the interests of Hamas and claiming that the decision had violated legal norms. According to Qatar, Hamas “was not provided with evidence of its involvement in terror and was not given the opportunity to present arguments in its defense.” Matthew Levitt from the Washington Institute of Near East Policy told Vedomosti that under European law, Hamas can be put back on the list only if evidence of European origin is presented. The UK submitted evidence in 2003, and now the lawsuit against Hamas is in court in many European countries. Those lawsuits could serve as evidence of terrorist activity, the expert said. The Kommersant business daily reports that the diplomatic efforts undertaken to implement the peace agreements reached in Minsk in September have had no effect. The contact group consisting of Russia, Ukraine, and the Organization for Security and Cooperation in Europe (OSCE) was supposed to meet with representatives of the breakaway people’s republics in the Donbass region of eastern Ukraine in December, but the meeting never took place. In light of the fact that the Minsk process has stalled and the ceasefire in the Donbass remains precarious, the leaders of Russia, Germany, France, and Ukraine are making another attempt to push the peace process forward. The growing political and economic costs borne by all the parties to the unresolved crisis in the Donbass have compelled them to redouble their efforts to normalize the situation in eastern Ukraine, Kommersant writes. “The Ukrainian crisis is becoming too costly for all the participants, and Russia is experiencing all the ‘charms’ of the highly unfavorable environment on the energy market, spiced with sanctions,” Sergei Utkin, head of the Department for Strategic Assessments at the Russian Academy of Sciences’ Center for Situational Analysis, told Kommersant. The United States is restoring diplomatic relations with Cuba, Gazeta.ru reports, citing a statement by President Barack Obama. The Castro regime and Washington severed ties back in 1961. According to Obama, the long-term sanctions have had no effect, and the American people are extending a “hand of friendship” to Cuba. The American president ordered Secretary of State John Kerry to “immediately begin discussions” with Havana to re-establish diplomatic relations. Obama said the U.S. will start taking steps to develop tourism and business on the island. However, the trade embargo with Cuba will not be completely lifted yet, Gazeta.ru reports. As observers expected, since the Democrats lost in the Congressional elections and Obama only has two years left in power, the president is now continuing the tradition of stepping up his foreign policy line, Gazeta.ru writes.